The Outdoor 6 is great for families and is equiped with latest solutions of Kettler in order to increase the fun to play. The Outdoor 6 is equiped with the practical one-hand locking technology and offers a comfortable and safe possibility to open the board halves. The integrated double wheels allow move well the table tennis table even on uneven surfaces. Some new accessory is integrated in the new line, which are meant to increase the fun to play of children and young adults. The elastic straps on the net posts offer storage space for bats, jackets or drinking bottles - and are easy to reach. Soft touch edge protectors can be attachted to the table. The protectors are inserted with pivotable wheels and offer an effective protection from injuries. The ball-box integrated in the table offers space for up to 10 balls and an effective storage space as well as the possibility of a short waiting time between the rallies. 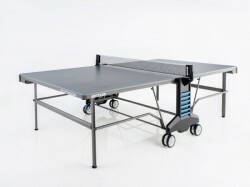 Kettler table tennis table Outdoor 6 add to comparison list.